Albina Dzhanabaeva, Russian singer and actress (ex member of the girl group VIA GRA, who starred in drame The Betrayal, a Russian film directed by Kirill Serebrennikov). On her blog Albina Dzhanabaeva has shared fragments of clips about Wassily Kandinsky, Kazimir Malevich, and Gustav Klimt. Don’t forget to post your photos and videos from the exhibition, using the #modernists hashtag. Today the most expensive painting in the world is Nafea Faa Ipoipo (When Are You Going to Get Married? ), painted by Paul Gauguin in 1892. 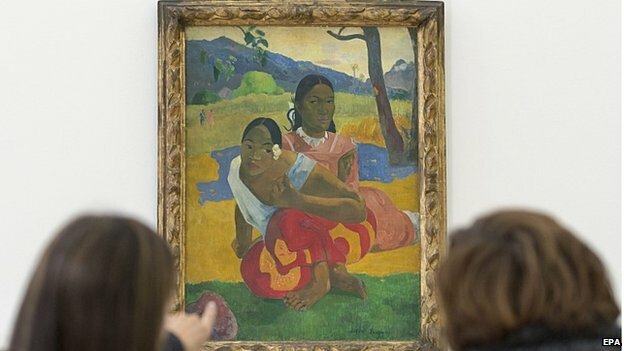 According to the New York Times, it was purchased for USD 300 million, although Rudolf Stähelin, the seller, a Basel-based collector, has not disclosed the price or the name of the new owner. The figure of USD 300 million and the details of the purchaser (the Museums of Qatar) were disclosed by Baer Faxt information resource. Now, insiders at the New York Times tell us that, yes, the painting was purchased by the Qatar Museums, and the price was negotiated sometime after last year. Mr. Stähelin, however, has neither confirmed nor disproved this information. The Qatar Museums, by the way, did not return our calls and e-mails.. This is just a reminder that the previous record price for a piece of art was also paid by Qatar. It is believed that the Qatar royal family paid USD 259 million for the Card Players by Paul Cézanne. This is to remind that you will be able to see the world’s most expensive painting in a multimedia format at The Great Modernists exhibition opening on Friday.